Georgia is an extraordinary young woman. While born with Down syndrome, she also is very much typical of her generation. She sends texts, emails and posts on Facebook. She listens to music, and is an active and enthusiastic athlete. She loves to bowl, to swim, to play basketball and to golf. She has won various championships in State of Illinois Special Olympics competitions across several sports. Georgia holds two jobs working 20 to 25 hours per week while she lives at home in Oak Park with her parents Karen and Glenn. She strives to excel in all areas of her life. She is a real joy and inspiration to those who know her. She is an articulate spokesperson and has spoken on Radio Disney regarding the Special Olympics and is a Global Messenger for the Special Olympics. 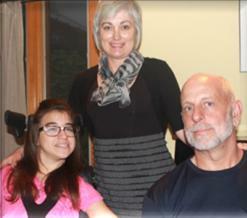 Her parents have always encouraged her to be an advocate for herself and others with developmental disabilities. A few years ago Georgia took the major life’s step of transitioning from Oak Park and River Forest High School. As she made this crucial move, she and her family secured assistance from UCP Seguin’s Building Bridges to the Future project. Through this innovative initiative UCP Seguin offers hands-on support to students with developmental disabilities who are about to leave high school. Like so many others, Georgia’s family wondered how to navigate the many complex steps to secure adult services in Illinois, from obtaining funding to cover adult services costs to applying for and receiving basic public benefits. The contact with UCP Seguin was first facilitated by the Transition Counselor at the high school, who connected with the UCP Seguin Transition Outreach Specialist (TOS) assigned to work at the high school. UCP Seguin’s TOS’s role is to work with the high school to identify students with developmental disabilities and their families in need of transition support. In this case Georgia and her family met with the Transition Outreach Specialist and developed a plan of action. The TOS assisted the family in ensuring Georgia was on the state waiting list for services; helped her to secure benefits to which she is entitled, such as Social Security or Medicaid; and helped to link Georgia with adult service providers, especially to address Georgia’s desire for community work. As children grow, public education is mandated to provide services to individuals like Georgia, but no such mandate exists for adult services. As a result many individuals with developmental disabilities languish without services and supports once they cross the threshold to adulthood. This puts additional stresses on them and their families. Georgia and her family, however, were able to avoid these pitfalls through UCP Seguin’s Building Bridges to the Future project. Today, she enjoys the assistance of UCP Seguin’s Community Employment Services. She is a proud, productive worker with an infectiously positive spirit. In fact, Georgia has taken on ever-increasing responsibilities and is in charge of the non-alcoholic beverage department at Trader Joe’s with limited guidance, aided by UCP Seguin’s support and commitment. Simply put, Georgia is amazing—a real “peach”! Six years ago, Bruce was in the midst of a major personal crisis. He made his “residence” in a PADS homeless shelter in a west Cook County suburb. Fortunately, through intervention of the homeless center staff and due to his disability, Bruce was referred to UCP Seguin for help. UCP Seguin offered both housing and an opportunity to work in a community setting — to rebuild his life that had come undone and led to a life of homelessness. Bruce liked what he saw at a UCP Seguin group home in Oak Park and moved in with four other men. There he received ongoing support to reach his goal of living in a more self-sustaining way. To assist with his goal, Bruce needed a job to make wages that could augment any government benefits to which he was entitled. Seguin offered a position to do building maintenance at one of UCP Seguin’s social enterprises, Seguin Gardens & Gifts. Bruce has since been responsible for the cleanliness of the retail store, back room, staff offices, and second floor production room at the Carr Center. Bruce has maintained perfect work attendance in his six years on the job and is always early for each and every shift. Bruce has accepted responsibility for ordering the necessary cleaning and paper supplies. He takes inventory of the supplies and writes down what is needed and gives the list to his supervisor. He is dedicated, reliable, and loyal — all that you could ask for in any employee. In addition, Bruce fulfilled his goal when he recently moved from the UCP Seguin group home into his own apartment in Oak Park. Bruce is diligent with his budgeting skills to ensure all of his bills are paid on time. He shops for himself and prepares all of his own meals. Bruce has become quite the pastry chef and happily bakes all the birthday cakes for everyone at Seguin Gardens & Gifts. Bruce has also had to overcome the challenge of getting to and from work using public transportation. Bruce was assisted by UCP Seguin staff to utilize public transportation and now navigates the western suburbs via Pace buses. Bruce has learned how to read the schedule to know precisely when the bus will arrive and to determine the stop at which to get off. Ordering supplies, paying bills, making cakes, and knowing a bus schedule are significant achievements for Bruce. 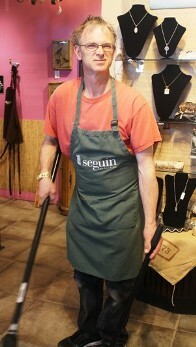 When Bruce first started at Seguin Gardens & Gifts, he could barely read or write. In the six years he has been working, he has spent time with Garden Center staff to improve his reading and writing skills. Staff bring in books at various reading levels and spend part of the lunch hour with Bruce practicing his reading and writing skills. Bruce demonstrates his improved writing skills in the completeness and accuracy of his supply lists as well as his birthday & holiday cards. Due to UCP Seguin employment, respite, and supported living arrangement services, Bruce has overcome major challenges in his life to reach a level of personal and financial stability as well as increased self-sufficiency. 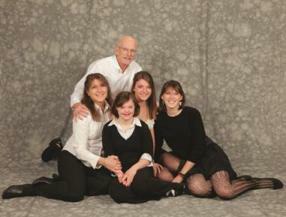 Cynthia is a beautiful twenty-two year old young woman, residing in Oak Park with her supportive parents Kris and Sheri. She enjoys life on many fronts: nuzzling up to her dog Beyoncé, spending time with friends, joking with her family. While she has cerebral palsy, Cynthia makes her way around using a specially designed wheelchair, and effectively communicates through her computer. This innovative initiative offers hands-on support to students with disabilities preparing to leave high school. It helped Cynthia and her family to register for the state waiting list, secure funding for adult services, and obtain basic public benefits. Cynthia now has access to home-based services, while using affordable door-to-door transportation to attend day services and enrichment activities, all under the auspices of UCP Seguin. She and her parents can breathe more easily…and Cynthia can build life skills, develop new friends, and act as a full member of her community.